The International Manufacturing Technology Show (IMTS) held in Chicago brings together technology solution providers, innovators, thought leaders and interested parties seeking to leverage innovations, and improved capabilities to impact their operations and bottom line. The IMTS 2018 Emerging Technology Center (ETC), hosted by the Association for Manufacturing Technology (AMT), a team consisting of Southwest Research Institute, AMT, and Vimana presented a practical demonstration showing a NIST grant-funded initiative leveraging open technologies to facilitate interoperability between manufacturing equipment team members. The demonstration was supported by Hurco Companies, Hexagon Manufacturing Intelligence, and Universal Robots. The intent was to show how a new version of the previously developed ROS-to-MTConnect bridge can be extended along with an extended MTConnect architecture, to enable a many-to-many interoperability that seeks to enable more intelligent interoperability. MTConnect is an open, royalty-free standard intended to foster greater interoperability between controls, devices and software applications, by publishing structured data over networks, using the TPC/IP. The initial project, mentioned above, demonstrated the ability to implement ROS-Industrial to enable the execution of robot paths and use the MTConnect protocol for communications between the robot and a CNC machine tool. Similar to the previous effort, this new solution is primarily software based and leveraged the open standard application level protocol, MTConnect, and the open source Robot Operating System (ROS) Industrial to enable facility-level interoperability between robot teams and machine-cell devices. The expansion of the previous ROS/MTConnect solution, further enhances the viability of using industry supported open source software for smart manufacturing applications. Open source software permits a continuation of free development, over a very large development workspace that ultimately solves complex problems where the solution is free to the end user. The output from this project is intended to enable industry-wide adoption of open source technologies, by providing a use-case and testbed showcasing lower cost solutions for comprehensive factory floor integration for the small- and medium-sized manufacturer. In parallel, it is anticipated that this work will foster and/or inspire other solution providers to incorporate this approach to leverage and incentivize both the leverage of open standards/open source as well as further refine their capabilities to align with the vision further moving the ball forward, enabling a future state where dynamic agile execution may be realized. demonstration at IMTS was intended to show the type of operation or intelligence that may be deployed by leveraging this new approach to interoperability. 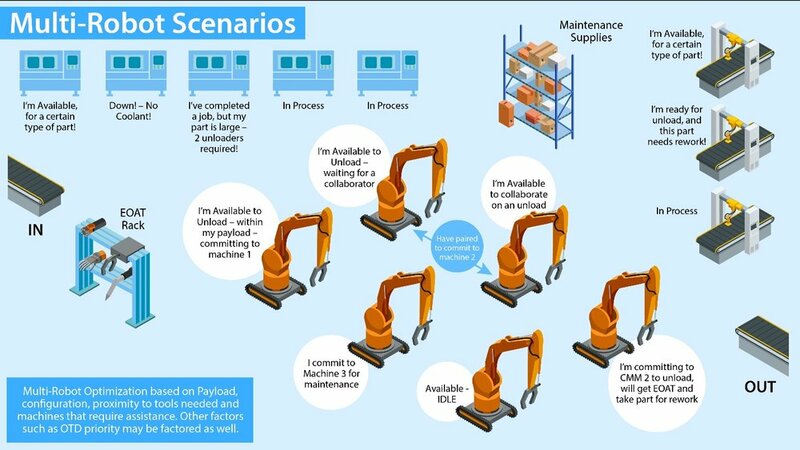 As seen in Figure 2, the intent is to enable a robot, leveraging ROS/ROS-Industrial, to communicate with other types of manufacturing equipment that already take advantage of the MTConnect standard, as far as communicating what they are doing. Figure 2. Robot able to “understand” what the other team members need and/or are doing. We are also demonstrating the ability of a robot to perform more than material handling tasks. The robot can also tend the machines’ need for a replacement tool or a coolant change. The MTConnect standard is providing the language to allow the equipment to express its needs, from the movement of material to the maintenance tasks required to keep the cell at top performance. The architecture for device orchestration and collaboration provides the framework for allowing multiple manufacturing processes to coordinate their activities to complete a task. The task-based models and the coordinator models can be seen in Figure 2. This architecture enables the ROS-I platform to provide the ability for the robot to find optimal ways to dynamically move material and other assets where they need to be. This framework is inherently extensible. For instance, industrial AI will be an essential addition to future capability, enabling the notion of autonomous, continuous improvement or dynamic optimization through learning. Plans can be previewed as conditions change and subject matter experts that choose to intervene to ensure consistency in value stream performance can also be additional input into this Industrial AI capability. Along with this software and supporting architecture will be a simulation test environment. This will enable testing of various scenarios. Within the scope of the current project is testing the scalability of the current developed state that was developed at IMTS 2018. This will include multi-robot scenarios to ensure the software and architecture support these use cases and of course support future iterations as we seek to extend the capability beyond one robot servicing to, say, one or two fixed assets. Both the software and the virtual test environment will be made fully open source with documentation. In parallel, the team is excited to see test beds assembled to enable further testing with hardware in the loop supported by additional research, non-profit, and even for-profit entities. The goal is to enable a future state where dynamism may be managed on-the-fly by enabling intelligent devices to effectively share information and act on it, both leveraging information from order to deliver systems, best practice rules, along with developments around industrial AI noted above. As we move forward towards smart, agile manufacturing, and we reduce the risk of inventory and static supply chains. Our ability to rapidly deploy equipment and repurpose it will be vital to expanding our industry and allowing for more customization and productivity. What was the reception at IMTS 2018? Overall, there were a lot of questions regarding the scope of the work: what it means, when is it available, and how do average end-users take advantage? The ETC was covered by team members from all organizations that contributed, and each brought a different perspective to what may be realized, what we would like to see next, and what specifically they heard from those they spoke with at the ETC. I think the team’s insights are interesting and my interactions with those that came by the ETC were very similar. It was exciting to interact with such a diverse audience, in the context of what their business is, what they sell or are looking to buy, and/or where they operate or are based. This diversity is part of the challenge when we talk about simpler interoperability, the simple “plug it in and it works”. I believe this is a simple, compelling, yet “lot to do” vision, and I hope you will stay engaged as this work moves forward. We will seek to have all the software open source by the end of October 2018 in the MTConnect GitHub repository. There are plans to have a physical test bed established so that both industry interested parties as well as NIST and other research organizations can continue to further the capability. Please let us know if you have any questions, or would like to learn more. A detailed final report as well as follow-on presentations will be upcoming, and we will announce those via our typical communication vehicles. In the meantime, please keep the dialog going. We always look forward to questions and feedback!